Housing developer Henley Homes has been chastised for blatant segregation. As part of its application for planning permission, Henley Homes was required to make a portion of its Baylis Old School development in South London available as ‘affordable’ and social housing. Obviously worried poor people will scare away the big bucks, Henley Homes blocked these units from the communal playground – which had been advertised previously as a “common area... for the use of all the residents”. It was only after the developers plans had been given the green light that they revised them, excluding the social housing residents from the “common area” with a hedge. In the planning stage the hedge was a gate, having had their initial proposal for a partitioning gate hedge rejected by Lambeth Council. To add a layer of sickening irony, the housing development was built on the site of a former state school, hence the name Baylis Old School.It is feared there is similar segregation across London’s housing developments, Green party leader Sian Berry imploring London mayor Sadiq Khan to ban segregated play areas. 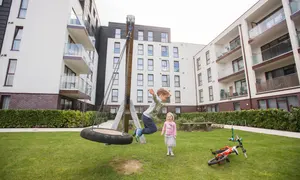 Khan himself said it was “disgraceful that children who live in the same development are not being allowed to play together.” Whilst James Brokenshire, the government’s housing minister, labelled the segregation “outrageous”. Following months of residents across all housing units (private and social) asking for the playground to be opened up to everyone, Henley Homes now say all resident children are welcome to the playground, in spite of the hedge and barriers remaining. Nice save!